Join Our Effort to Get Cats Adopted! It’s estimated that more than four million cats and kittens enter animal shelters nationwide each year. To help find loving homes for cats, Francisvale is waiving its adoption fee for all cats for the month of June. Pass the word around and help us get these kitties adopted. 1. If you’re thinking about adopting a cat, consider taking home two. 2. Find a cat whose personality meshes with yours. 3. Pick out a veterinarian ahead of time and schedule a visit within the first few days following the adoption. 4. Make sure everyone in the house is prepared to have a cat and is involved in the adoption process. 5. Budget for the short and long-term costs of a cat. 6. Stock up on supplies before the cat arrives. 8. Keep your new cat in one room for the first couple of days to get him use to his new surroundings. 9.Go slowly when introducing your cat to new friends, family, and other pets. 10. Have patience and give plenty of love. 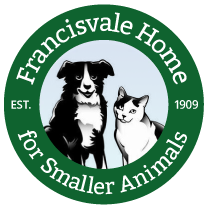 Francisvale has many wonderful cats that need a loving homes to call their own. Please take a look at our adoptable cat section and fill out an application today. You will have a devoted companion for life. They will be waiting! This entry was posted on Tuesday, June 7th, 2011 at 11:26 am	and is filed under News.